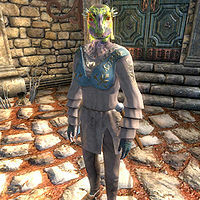 Sheer Meedish is an Argonian commoner living at The Choosy Beggar in Bliss, New Sheoth. She is married to the exorbitantly jealous proprietor Raven Biter, who specifically warns all customers to stay away from his wife: "Just keep your eyes on the menu, and off of Sheer Meedish." Nonetheless, Sheer doesn't shy away from socializing, partying, and, most importantly, drinking with each and every person who visits the inn. She sleeps on the second floor of the inn every night between midnight and 6am. She spends her morning wandering around the ground floor until 10am, when she leaves for the Sacellum Arden-Sul. After two hours of praying, she pays Dumag gro-Bonk a two-hour visit over at The Missing Pauldron. At 4pm, she exits Bliss through the southern gate and walks down the street in Crucible to visit Earil, the proprietor of Earil's Mysteries. At 4pm, she returns to The Choosy Beggar, where she will wander around until bedtime while socializing with her husband and the other regulars, interrupted only by a two-hour dinner at 6pm. While you are doing business in the Sacellum Arden-Sul during Ritual of Accession, Sheer Meedish will skip her 4pm prayers and socialize in the inn instead. She wields an iron shortsword and wears brown trousers, a brown tunic and orange loafers. She only carries a small amount of gold. Sheer Meedish knows the standard leveled Rogue spells. When you approach her, she will shout out: "Buy us a drink!" If you talk to her, she will immediately invite you: "Good to see you. We should have a drink sometime." Upon exiting conversation, she will bid you farewell with a thirsty: "Come back for a drink!" Even if you return to her as Sheogorath after completing the Main Quest, Sheer Meedish will be willing to party: "Cheers to Sheogorath!" If you speak to her, she will cheer: "A drink to the health of our Lord! ", while she will bid you farewell with a disappointed: "Good seeing you, Lord Sheogorath. Could have bought a round, though...."
Someone new in the Isles? Don't care. Plenty to drink for everyone. The Gatekeeper dead. Let's drink to the Gatekeeper! Again the Resonator draws men near. Screw 'em! I drink to their health. Healths. Whatever. A Chalice for Thadon! I like chalices. And mugs. And steins. Cups are good, too. Syl had folks tortured again. So what? Real torture is my mug being empty. Let's celebrate the relighting of the Torch! Drinks for everyone! Cheers to the new ruler of Dementia! Drinks all around! Thadon is dead. I drink to his health. Or... whatever. I heard Passwall has been destroyed. Damn shame. Used to drink with some of those folks. Let's drink to the health of the new Gatekeeper! Our Lord's armies are at full strength. A toast to Our Lord! Sheogorath is missing. A drink in his order is in honor. Honor is in order. Whatever. A toast to Sheogorath! Order is no more. If Sheer Meedish is killed and her tombstone in New Sheoth Graveyard is activated, it will read: Beloved wife and loyal drinking companion. This page was last modified on 16 August 2018, at 15:49.